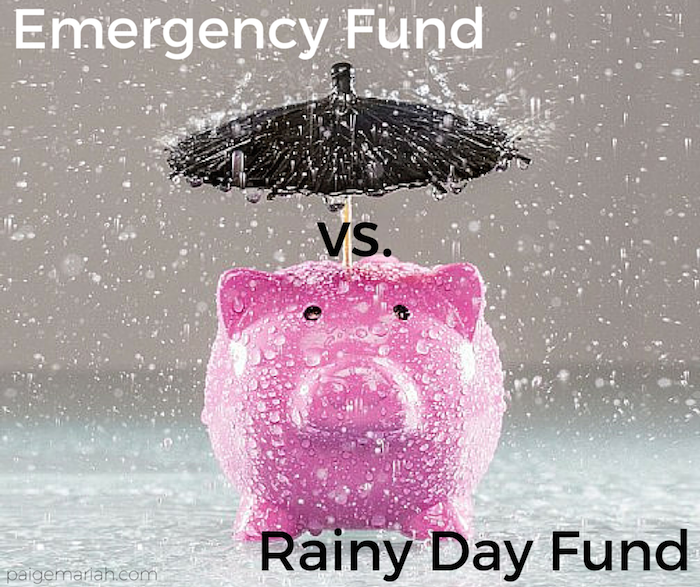 Emergency Fund vs. Rainy Day Fund: The importance of having both! An emergency fund and a rainy day fund..if you’re anything like me, you probably thought that these terms were interchangeable. Honestly, I didn't learn the real difference until I began my career last year and financial literacy climbed the ladder of importance in my life. An emergency fund and a rainy day fund do have one major thing in common.. they involve saving money. However, the two definitely have different definitions and purposes that everyone should understand and consider. An emergency fund is a reserved amount of money savings that one puts aside and is only considered for use in the case that regular income becomes disrupted. It saves you in those times of financial distress and helps you stay above water until things hopefully go back to normal. Typically, financial experts suggest that you should have at least 6 months worth of expenses in this fund. Therefore, if you ever lost your job and your income halted, you would be able to maintain for at least half a year while searching for a new one. Now, how much stress and burden do you think that would save you? Thankfully, I have a mother who can double as a financial coach, because she got me into the habit of saving immediately. I decided to move back home with my family after graduating college in 2014 and have been contributing a great amount to my savings account aka emergency fund monthly. Along with contributing to a retirement fund, I also decided on a specific savings goal for myself and have decided to not move out until I have hit it. I’m obviously aware that the amount of money that I’m able to save now will greatly decrease once I begin paying rent, so I’m taking advantage of this current opportunity. Once I hit this goal and move out, I will definitely never touch that money unless I come across a severe hardship. I will continue to contribute what I can to my savings but I will definitely be assured by the amount that I was able to contribute to it before moving out. A rainy day fund actually holds a slightly different purpose and it is something that I aspire to have in addition to my emergency fund once one day in the future. A rainy day fund holds the money that you have set aside to use for unexpected one-off expenses. These are not necessarily critical situations but they can definitely be inconvenient. For example, you get a flat tire and need to replace it, or you get a surprise red light ticket in the mail ( recently happened to me, *rolls eyes*). These are expenses that you weren’t planning for, but with a rainy day fund you are prepared and less affected by the sudden need to produce this money. Being fresh out of college, regularly contributing a significant amount of money to my savings/emergency fund is all that I can manage if I would like to continue having a social life. However, once I begin to make more money, I definitely plan to create a rainy day fund for myself as well. Finances have the ability to bring on a lot of stress and anything that I can do to lighten the load for myself, I will. Sitting out on a few happy hours a month or bringing a lunch to work instead of buying, won’t seem like such a big deal when an unpredicted car repair can easily be paid for with money from that rainy day fund. Everyone’s financial situations are different but I cannot express enough how important it is to SAVE. How much or how often you decide to contribute to your emergency or rainy day fund is up to you but trust me...you won’t ever regret it. It is such a calming feeling to know that you’ll be able to stay afloat in times of financial distress. Saving is something that you can begin slowly. Even beginning by putting as low as $20 aside a paycheck can help, because the money will add up! Go ahead and do yourself the favor, your future self will one day thank you. Do you contribute to an emergency or rainy day fund? Let me know how it’s positively benefited you in the comments!